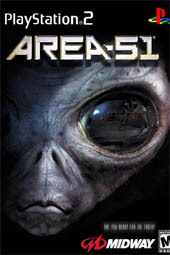 Area 51 is a big budget game block buster that is set in Area 51, the U.S. governments most top-secret and secure facility that is located in the Nevada desert. Fortunately for the free world, gamers take on the role of Ethan Cole, a hazardous biological waste specialist who is sent to investigate this disaster of epic proportions. Unfortunately for lieutenant Cole, he stumbles across the U.S. governments most heavily guarded secret... that aliens exist and what started out as a simple hazard investigation soon turns Cole's world upside down as he encounters a deadly alien mutagen that threatens the very Earth itself. Interestingly enough, Ethan Cole is voiced by the emotionless David Duchovny who really helps immerse the players into this world of secret government black ops and alien abductions. Cole, who is part of the HAZMAT team is sent to figure out and fix the newfound viral happenings in the underground, super-secret government testing facility in New Mexico. Although the game may seem like an episode of the X-Files thanks for Duchovny's Mulder like character, the game also stars Marilyn Manson who lends his acting talents to the opposition. Right from the beginning the action in the game ranges from frenzied to frantic, separated by brief moments of tense quiet. 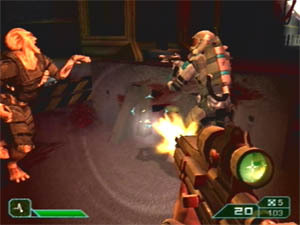 You may enter a room and find a horde of aliens charging in through another entrance, followed shortly by another way that breaks in through a high window. You’ll hardly have time to breathe as you empty hundreds of rounds into alien flesh punctuated with a few timely grenade blasts. Luckily you will have some help in the form of your squad who prove to be quite competent in killing aliens, mutants and the like. They are invulnerable to enemy attacks until scripted to die, and so are quite helpful during the particularly hairy moments. They’re even invulnerable to friendly fire, so if you accidentally pop one of them in the back you’ll get an expletive deleted from him but he will keep on fighting. All of this mayhem makes for some great action and consequently fun as well. To give you a feel for the kind of action it provides, I can tell you that Area 51 is one of the first games that captures the tense and chaotic feel of the movie Aliens. Cole begins with a pistol, which actually feels pretty good. Soon he’ll find some automatic weapons, grenades, shotgun and so on to contribute to the standard human fare. 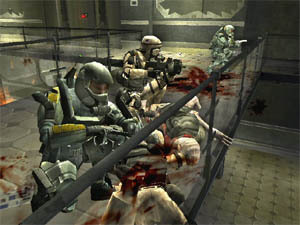 Another unique aspect of the game comes as a result of a viral infection. This infection gives you the ability to mutate at will, turning into a powerful creature. Your vision will become thermal-based, allowing you to detect the heat signatures of any enemies in the area. You’ll also gain new powers that will allow you to launch viral attacks at nearby enemies and you’ll be able to take more damage. While it is cool to play as a mutant, the game does not fully take advantage of your mutant abilities and you can just as easily finish the game without resorting to mutant form. The graphics are grimy and nicely detailed. The character design is not that great, which is surprising, considering the wide-open canvas of “mutant” and “alien.” On the flip side, explosions, animations and projectiles are meaty, adding a great touch of immersion. The cinematics go back and forth from the in-game engine to CG, and both scream high production value. Unfortunately the audio takes a backseat to the visuals. While not as prominent, the music swells when it needs to and explosions and gunfire rock the surround system as expected from high-dollar production. Overall, the ten to fifteen hours of the story mode prove to be full of four or five memorable moments that are totally worth a once-through, if you have the patience to sit through an interesting but not original first person shooter. The multiplayer modes prove to be more claustrophobic than they ought with regard to level design, but they do serve up a solid online experience on the PlayStation 2. Check it out!